Assisting Hands Home Care provides home health care services in Lombard, Villa Park, Elmhurst, Addison, IL and the surrounding areas in DuPage county to help senior citizens and adults with disabilities live safely at home. Our home health care services include senior/ elderly home care, memory care for Alzheimer’s and dementia patients, companion care, respite care, hospice care, and assistance with activities of daily living (ADLs) including bathing, restroom use, meal preparation, grocery shopping, prescription pickups, and transportation to doctor appointments. Most senior citizens who need care and assistance are choosing to stay at home and receive care instead of leaving for a nursing home or assisted living facility. By aging in place, senior citizens can preserve their independence and remain in their home that they worked for throughout their adult lives. The home care services that we provide at Assisting Hands will help ensure that your loved ones who have chosen to age in place will receive quality, effective care right in their own homes. We start our home care services by sending a member of our staff to the home to meet with the care recipient and their family. The purpose of this meeting is to help our staff understand the care needs of your loved ones and form a care plan with your help to ensure that their needs are met. Our caregivers will provide quality home care for your loved ones and always treat them with compassion and respect. They are each trained, bonded, and insured and committed to providing the best possible care for your loved ones. Our caregivers will also get to know your loved ones and build a personal relationship with them to be their friend and social companion as well as their caregiver. If you have a loved one in Lombard, Villa Park, Elmhurst, Addison, IL and surrounding areas in DuPage county that needs home health care to age in place, contact Assisting Hands Home Care by calling (630) 313-6160. Visit County of DuPage’s Website for more information about senior care resources in DuPage County, IL. As people get older, providing self-care can become more difficult or even impossible to handle. Our caregivers will help your loved ones with these activities of daily living including assistance with bathing, using the restroom, getting dressed, taking medication, and ambulation (See Full List of ADLs). Many housekeeping tasks may be too physically demanding for senior citizens and those with disabilities to handle. Our caregivers will help keep the home clean by taking care of several housekeeping tasks such as laundry, vacuuming, sweeping, emptying trash, and dusting among others. It is important for seniors and those with disabilities to get regular, nutritious meals. If your loved ones have difficulty cooking for themselves, our caregivers will prepare meals that account for their dietary restrictions. You can expect our caregivers to prepare and serve the meal and clean up. Many seniors must give up their driving privileges as driving may become too dangerous. If seniors cannot drive, they cannot easily handle errands such as grocery shopping or get to doctor appointments or visit family. Our caregivers can give your loved ones rides so they can visit family and get to doctor appointments, and we can also help with errands. Loneliness is common among seniors, especially if they live far from family and friends. Our caregivers will be a friend and companion for your loved ones to reduce feelings of loneliness. We will build a personal connection with your loved ones through conversation and by engaging them in their favorite hobbies and activities. Seniors who are affected by Alzheimer’s disease and other forms of dementia need constant care and it is best for them to receive care in their home because the environment is familiar and comforting. Our caregivers have received specialized training to provide effective memory care for Alzheimer’s and dementia patients in their homes. We can help slow the effects of memory loss with mentally stimulating activities and respond to mood swings and agitation with positive reinforcement techniques. Some senior citizens and adults with disabilities may need assistance 24 hours a day. We provide 24-hour care and live-in care services to help those who need constant care and supervision. With our live-in care services, a caregiver will live at the home with your loved one and with our 24-hour care services, we assign two caregivers who will alternate every 12 hours and stay awake through their entire shifts. No matter what the care needs are for your loved ones, Assisting Hands will ensure that their care needs are met. We provide personalized care services that are based on the care needs and schedule of your loved ones and we can always adjust the care plan to accommodate changing needs. Call Assisting Hands Home Care today at (630) 313-6160 if your loved ones could benefit from professional home health care services in Lombard, Villa Park, Elmhurst, Addison, IL and surrounding areas in DuPage county. 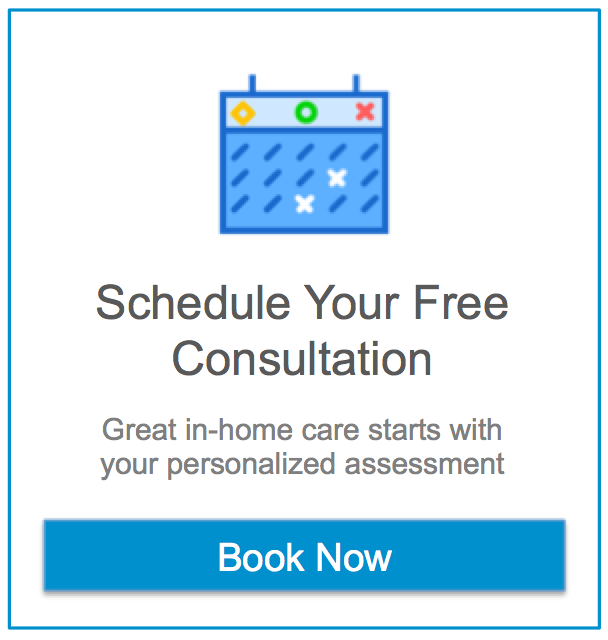 We will provide you with a free initial in-home consultation.